Preheat the oven to 450 degrees. Toss cauliflower with 1 tablespoon oil, salt and pepper. Spread out on a sheet tray and roast for 30 minutes or until tender and beginning to brown. While the cauliflower is cooking, add the remaining oil to a large pot. Add the carrots, cumin seeds, and paprika and cook over medium heat, stirring frequently. Once the seeds become fragrant, 2-3 minutes, add the garlic and cook another 30 seconds. Add the lentils, bay leaves, and water. Bring to a boil and simmer, uncovered, until the water is absorbed and the carrots and lentils are tender. Remove from the heat. 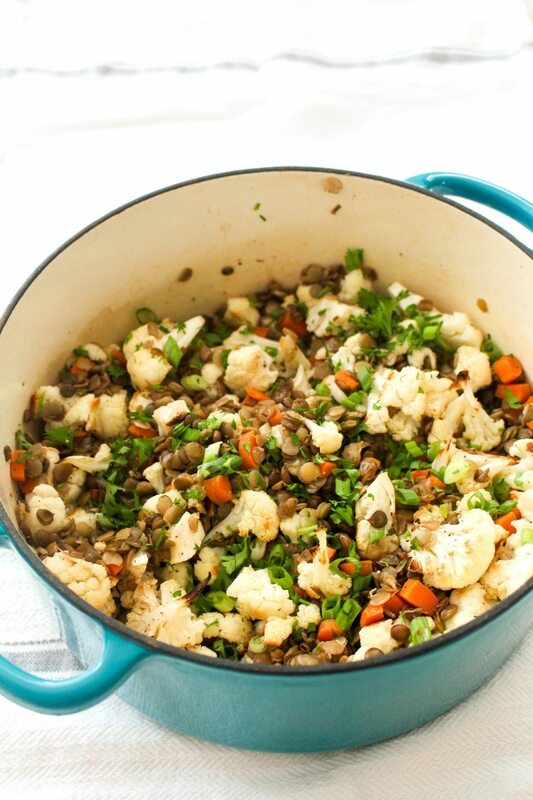 Combine the lentils with the roasted cauliflower, parsley, and scallions. Whisk together all of the dressing ingredients and drizzle over the vegetables. Serve warm or cold.